It started with one simple check – the biggest check Rena Wynn, owner of Sebago Dock Company in Windham, writes every year: a $42,201 payment mailed to a plastics corporation in Canada for vinyl decking material. But little did Wynn know by mailing that check her company would be inadvertently drawn into an international scam to steal millions from banks and unassuming victims across the United States. When the plastics corporation called on April 18 – three weeks after the check was mailed – to tell Wynn it just received the payment, she thought nothing of the check’s late arrival in Canada. 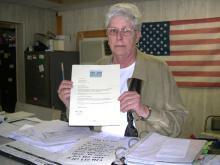 That is until she got the first call from her bank, Maine Bank & Trust, concerning a forged check for $40,201. A woman in Illinois had attempted to cash the counterfeit check in the name of Sebago Dock Company. Wynn reported the check as fraudulent and immediately closed her bank account. Alabama, Massachusetts, Texas, Montana, New Hampshire, California… some scams were part of fraudulent online loans, others were part of international lottery schemes. These lottery schemes are what the Federal Bureau of Investigation identifies as “advanced fee” scams. In a letter, a recipient is told they are the winner of a large sum of money through an international lottery. They are then instructed to cash a check enclosed in the letter and wire the money back to the supposed lottery organization in Canada to pay for “processing fees” before the recipient can receive their winnings. The letter looks professional and the counterfeit check is nearly identical to a real check. If banks accept the check, it bounces a few days later when found to be counterfeit, but the victims in most cases have already wired money to the phony lottery organization believing the check is legitimate. “It’s financially devastating for many people (who are victims of these crimes),” says Gary Cacace, Special Agent for the FBI’s Economic Crime Task Force in Boston. The Federal Bureau of Investigation constantly collaborates with Canadian authorities to track down and bring to justice syndicates of telemarketing, check fraud and other “white collar” crimes. But the problem is that these organizations can pick up and move quickly if alerted to an investigation, Cacace said. In recent years, the problem of crime syndicates in Canada, who target victims within the United States, has grown and the Internet has allowed them to cast a greater web. These fraud operations take place in “boiler rooms,” Cacace said – illicit call centers set up to receive and solicit money from unassuming victims who believe they are the day’s big winner. Often times, these call centers hire young college students who are unaware they are breaking the law. These boiler room operations not only purchase confidential information, but also purchase lists of potential victims and sometimes re-victimize a person by claiming to be an authority who needs their personal information or money to pursue their case. One woman from Indiana told authorities she received one of the fraudulent Sebago Dock Company checks from a supposed international lottery organization posing as the “Wishing Well Foundation,” a real charity based in Florida. Vicki Torbush, executive director and founder of Wishing Well, has contacted state and federal authorities about the fraud, but no one has responded to her repeated calls for actions. Her charity grants wishes for local children in Florida with life-threatening illnesses and would never run a “lottery,” she said. But since March, Torbush has dealt with an onslaught of angry phone calls from victims of the lottery scheme. Since the initial fraud, victims across the country have attempted to cash hundreds of counterfeit Sebago Dock Company checks of sums ranging from $2,000 to $275,000. Wynn tallies the attempted fraud at close to $2 million. She believes her check information was sold to a series of scammers due to the wide variety of scams attempted in her company’s name. Prior to the incident, Wynn had been extremely careful to guard herself against any fraud or identity theft – shredding important paperwork, guarding her checkbook, never shopping online or giving out private information over the phone. She believed she would be safe from these scams as long as she kept her information private. In Canada, the Royal Canadian Mounted Police division in Ontario has set up a police-run international call center called “Phonebusters” to deal with the volume of fraud cases involving Canadian-based scammers who uses citizens in the United States to cash their fraudulent checks. It has become increasingly frequent that these scammers target U.S. companies, steal their checks and duplicate them through the use of computer software and special paper, said Barry Elliott, head of Phonebusters in Toronto. As is believed in Sebago Dock Company’s case, checks are stolen right from Canadian mail through the theft of postal bags or even whole postal mailboxes, he said. It is believed these scammers are not native Canadians and part of Nigerian organized crime who have established small “cell operations” in and around commercial hubs like Toronto and Montreal, Elliott said. These crime organizations are believed to be the same creators of the elaborate Nigerian letter scam where a Nigerian benefactor informs a person that they need to transfer millions of dollars out of Nigeria to keep it hidden from authorities. They prey on people’s trust using the allure of a “get rich quick” scheme, Elliott said, and the only way to prevent new incidents is to be educated about these frauds. No state or national lottery ever asks for a fee to process your winnings, he said, nor do they establish a timeframe to collect. “If they want you to pay a fee, you’re not a winner you’re being conned,” he said. The Maine State Police is currently investigating Sebago Dock Company’s case with cooperation from the Royal Canadian Mounted Police, but chances are slim that the actual perpetrators of the mail theft and counterfeit will be caught, said Sgt. Matthew Stewart of the Maine State Police. State police have been in contact with many victims who received the counterfeit checks from these phony lottery organizations. A similar case took place two years ago when a non-profit company from York sent a check to a charity to Africa, he said. Stewart said the best way to prevent this type of crime is to educate consumers. Wynn said she will no longer mail checks to Canada, but instead will wire money when doing business internationally in the future. Even with her bank account closed, she still continues to get calls about fraudulent checks in her company’s name and has talked with some of the victims – one of whom said she even quit her job because she truly believed she had won the lottery.